Like soy sauce before it, miso is a defining element of Japanese food that is now finding its way into the wider world of international cuisine. Most Americans are first introduced to miso through miso soup. But given the chance to work with it, people find miso adds depth of flavor, umami and nutrients to everything from meat loaf to ice cream. Five chefs spoke about, then demonstrated, their use of miso in July at a tasting panel at the California Culinary Academy in San Francisco. Of the five, only one chef was Japanese. During Japan's centuries-long internal wars between various city-states and clans, miso made the perfect food for traveling samurai: it stores well for long periods, is lightweight, and contains many vital nutrients. In fact, Japan's first miso factory was started by a military commander in Sendai. Miso has never been restricted to a single type. The flavors and colors vary greatly depending on the source ingredients. Miso is usually made from a mixture of soybeans and a malted grain. About 78% of the miso in Japan is made with rice, while about 6% is made with barley. Some miso – about 5% -- is made purely from soybeans, while 11% uses some mixture for the malt. 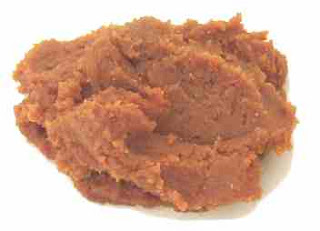 Soybean-malt (“mame”) miso is dark brown, with a deep, rich flavor. Barley-malt (“mugi”) miso can be either light yellow, with a sweet flavor, or red, with a full-bodied flavor. Rice-malt (“kome”) miso has the most varieties. As with wine, there are great regional differences in miso, but it is less from the raw ingredients than tradition and process. To make miso, soybeans and the grain are steamed until they break down into a mash. A koji mold starter is added, and the mixture is fermented and aged. Different regions achieve different flavors by introducing the koji at different points in the process. Kyoto residents like their miso very delicate, while in Nagoya, they like it as potent as possible. Among its other potential health benefits, miso is believed to help prevent type 2 diabetes, reduce hypertension, reduce the rate of bone loss in women suffering from menopause, and even reduce radiation sickness. People who drink a cup of miso soup every day are believed to have a 33 percent lower chance of developing stomach cancer. The five chefs took a tour of Sendai earlier this year, along with a visit to Tokyo, where they said they ate only street food. Terje said the eye-opening dish for him on his Japan visit was beef brisket and beef tendon simmered in a miso broth that he ate at a Sendai restaurant run by a relative of Kamio, his fellow panelist. Terje said that creating appealing vegetarian and vegan cuisine is a constant challenge, particularly in the Bay Area, where so many diners insist on it. Miso is a huge help because it adds richness and protein, yet is totally vegan. It's ironic that Kamio ended up with the dessert course, because as a native of Sendai, he has the longest experience with miso as an ingredient in savory dishes. Perhaps that gave him the confidence to create a dessert that actually had the strongest, most noticeable flavor of the miso itself, sending the audience out into the evening with a sweet taste of miso on their palate. Kapur's dish led off with very delicate flavors and textures; miso's richness was noticeable in the sauce, but not much on the fish itself. If Kapur's dish wasn't particularly Japanese, Terje's was even less so, even though the flavor of miso was unmistakable. The dish was assigned as a “salad course,” but Terje interpreted that loosely with his fried green tomato topped with rich burrata cheese. The cornmeal breading on the tomato had enough crunchiness and miso flavoring to be reminiscent of a miso sembei (rice cracker), an irony because Terje said he hadn't ever tried one; he just hit on the combination in his search for the purity of the ingredients. While his intent was purely to make the dish delicious, Hill also showed that miso has an interesting effect on a dish's richness. All the chefs agreed beforehand that miso can be used to make a broth richer, and can even be used as a substitute for butter. But in this dish, Hill showed that miso can prevent a rich, fatty fish like black cod from being overly rich. “The black cod can be almost too rich in some preparations, but miso cuts through the richness of the fish," Hill said. Canales, who has used miso in cured meats, did not shy at all from richness in his dish, Pork Belly Cacciatore. That said, the miso flavor was completely hidden. Kamio's dessert course of two different miso-flavored ice creams was accented by miso shortcake. He said he liked using miso in sweet dishes because “it adds a lot of depth and it's not what you expect from a sweet dish.” Still, he said that even though it has its own sweetness, miso is a challenge in sweet preparations. “Miso is really salty and hard to control for dessert,” Kamio said. While the food was being served, audience members and presenters related unconventional ways in which they had used miso. “A friend said yesterday she put miso in her cheesecake and it made it more 'adult',” said Thy Tran, cookbook author and director of the Asian Culinary Forum. “When I cook beef with onions, I add miso to the broth to give it more layers of flavor,” said a food product developer. Kamio said he likes to use miso when barbecuing. The outpouring of creativity with miso is to be expected, said Rona Tison, Vice President of Corporate Relations for Ito-En North America. Miso is a relatively new ingredient for non-Japanese, who are just beginning to realize its possibilities. She made an analogy to another soy-based product that has been a very successful crossover. Mix miso and buttermilk into a smooth batter. Season with salt and pepper. Dip slices of green tomato in miso-buttermilk mixture, then dredge in cornmeal. Fry slices of tomato in hot oil (375F) until crisp. Let drain on paper towels. 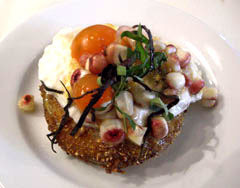 Place a slice fried tomato in the center of the plate. Top with burrata cheese. Season with salt and freshly ground pepper. Spoon salad over burrata cheese. Drizzle plate with a little bit of balsamic vinegar. Brew the tea bags in the hot water and allow to steep for 5 minutes. Remove tea bags, squeezing out liquid. Set aside. In a non-reactive saucepan, combine cream, milk, and mizuame. Bring to a scald while whisking occasionally. In a separate bowl, whisk egg yolks and sugar until color is pale and mixture is lighter in color (about 3-4 minutes). Temper the cream mixture into the egg yolks by adding the cream slowly while whisking. Return contents to the saucepan. Continue cooking and stirring making sure that a thermometer reads at least 50 degrees Celsius and taking care that the miso does not burn on the bottom of the pan. Remove from heat and strain through a chinois. Chill in an ice bath or overnight for best flavor development. Spin in ice cream machine according to manufacturer’s instructions.